We stock import and domestic A325 bolts. 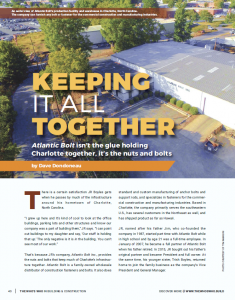 A325 bolts are heavy hex structural bolts designed for connecting steel to steel. 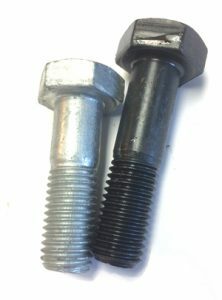 These bolts differ from standard hex bolts in that they have heavy hex heads (thicker and wider to more effectively distribute the load) and shorter thread lengths (the weakest portion of carbon steel fasteners is the threaded portion so shorter thread lengths creates a stronger bolt) to increase their strength. A325 bolts are available in diameters ranging from 1/2″ to 1 1/2″ and from 1 1/4″ to 12″ in length. Tensile strengths are 120 ksi for 1/2″ to 1″ in diameter and 105 ksi for 1″ to 1 1/2″. 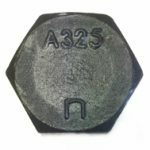 A325 bolts come in plain finish or galvanized and require heavy hex nuts: ASTM A563 grade C or DH nuts are acceptable, and F436 hardened washers. ASTM A194 grade 2H nuts are an alternative as are ASTM F959 compressible-washer-type direct-tension indicator washers. Call (704-597-5082) or email us for a quote today.